Beginning his career as a painter in the early 1950s, Bay Area artist Lee Mullican resisted the dominate ideas and expressionistic painting style of his contemporaries in the New York School. Mullican refused to deny subject matter or spirituality in his work, which was inspired by such varied sources as Surrealism, Cubism, Japanese Buddhist art, the objects made by indigenous people of the Americas, and his time drawing topographic maps for the US military during World War II. Mullican’s signature marks come from using the spatula-like edge of a printer’s ink knife, a technique he called striation. 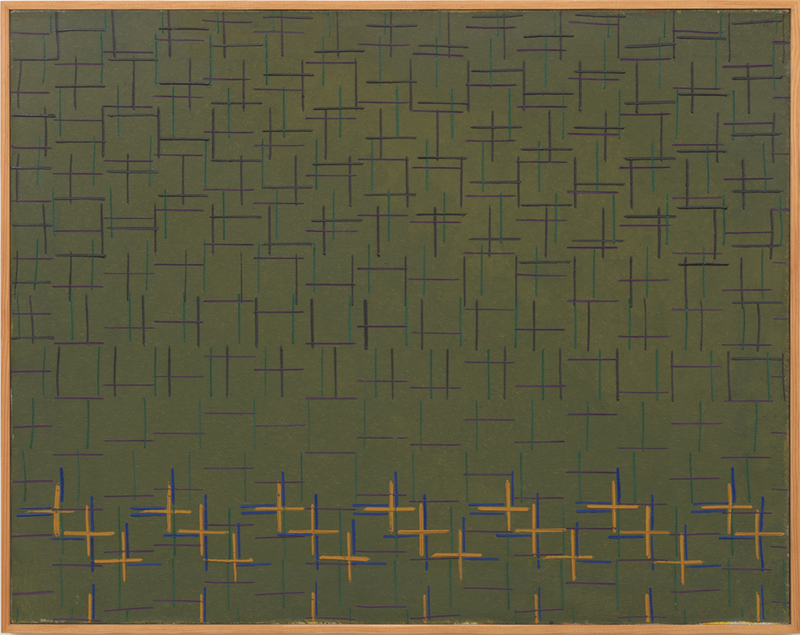 These lines appear throughout most of his paintings; lines radiate out, outline geometric shapes, or move in unison to suggest a woven tapestry. The repetitiveness and care of the paint application was a practice in meditation, and the energy of his painting comes from his careful study of nature and pattern. In this work from 1974, Mullican’s striations gently protrude out of the work, adding an unexpected three-dimensionality. A network of lines connects and disperses in a rhythmic flow down the work’s surface before subsiding under the brighter cross marks at the bottom of the painting. Mullican exhibited at the San Francisco Museum of Art during his lifetime, and his work is in the permanent collection there, as well as the Whitney Museum, New York; LACMA; and the Metropolitan Museum, New York.